Keiko Tomita will have an exhibition at The Chelsea International Fine Art Competition Exhibition on August 22 - September 11, 2014 in New York New York. Within the early drawings of mankind, Keiko Tomita discovers a deeper, primitive kind of memory and an enthralling spiritual essence. Powerfully modern yet timeless, Tomita’s art speaks of a shared history, as a primal expression of mark and space is darkly rendered on paper in black, grey, and white with a rich depth of line and tone. 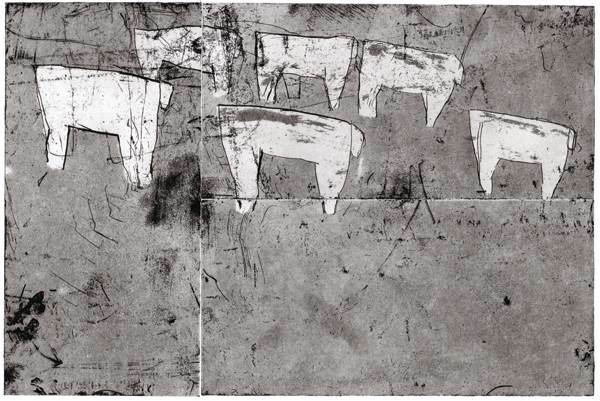 From the imagery of animals and natural forms occasional traces of text emerge, boldly binding past and present together. Now exhibiting throughout Japan, Keiko Tomita found artistic inspiration while studying archeology at university and learning copperplate engraving after graduating.